The domestic leagues are about to start and as always, we have a huge assortment of the newest club shirts for the new 2018/19 season. 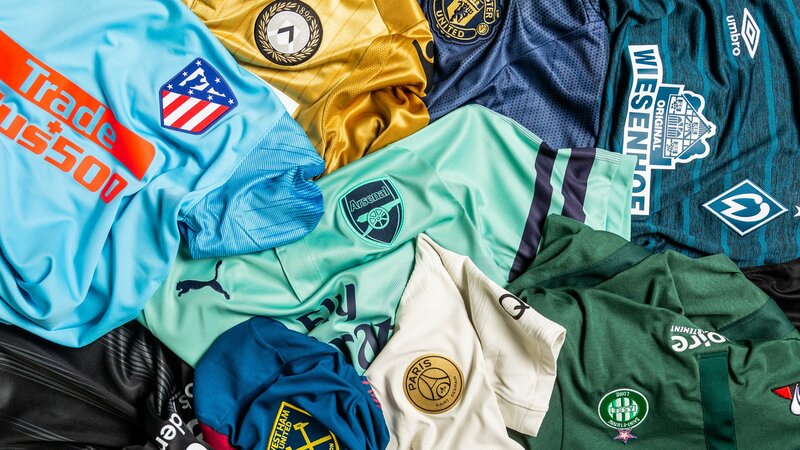 Go through our Top 10 of the newest club shirts this season. On 10th place of our Top 10 we find the Werder Bremen Away Shirt. 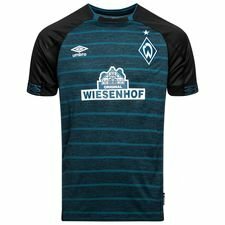 Werder Bremen changed their shirt manufacturer to Umbro this season, and that was not a bad idea. They provided the Germans with a stunning navy-blue Away Kit, to complement their classic green Home shirt. The Away Shirt has the well-known Umbro sleeves which can be spotted on multiple Umbro club shirts, and this only makes the shirts look even better. 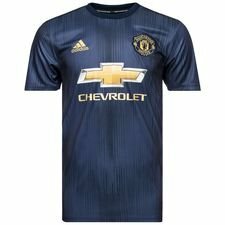 On 9th place we find the blueish Manchester United Third Kit. It’s made with a nice visual design on the front which complements the blue colour and golden touch on the logos. The Parley for the Oceans collaboration only makes this Third Shirt even more great, due to the cause it supports. Udinese is known for pulling out some eye-catching things on the pitch when it comes to shirts. 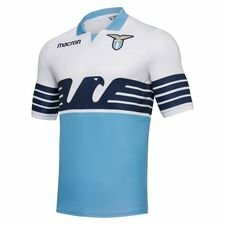 Last season the players wore 11 different home shirts against a Lazio, where 10 of them was their 10 previous Home Shirts. This year Macron has given them a golden touch, with a completely golden Away Shirt, absolutely stunning! 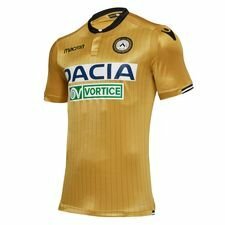 Could they have made the shirt of the season in Serie A so far? Well let’s find out by going through the list. Nike is known to make some of the wildest Away Shirts every season, and this year is no exception. 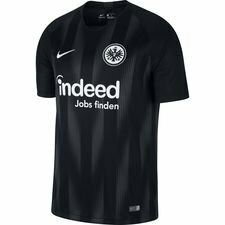 On the 7th place we find the Frankfurt Away shirt, which is kept rather stylish and simple, yet eye-catching and stunning. The basic black colour is combined with some subtle greyish stripes, while their black and white crest is meant to be for the Away Shirt. 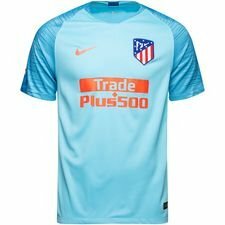 On 6th place we find another Away Shirt from Nike, and it’s the sky-blue Away Shirt from Atletico Madrid. The Away Shirt is made with the Vaporknit template, which gives the shirt darker toned sleeves with the refreshing pinstripe design. The iconic crest is combined with a red Nike logo and sponsor logo. Overall everything works together to place this shirt on 6th place. Mint seems to be this seasons colour, and the same goes for the Arsenal Third Shirt. PUMA has recently stepped their shirt game up a notch, and this Third Shirt is a prove that they can do some awesome things. 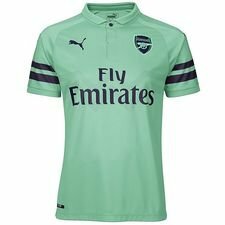 The Arsenal Third Shirt comes with a mint green colour with purplish colors on the crest, logos and sleeves. Furthermore, the shorts and socks are made in the same design, which gives this kit a complete look for the new Premier League season. The Saint-Étienne Home Shirt is placed on our 4th place with the stylish and simple green shirt from the French brand Le Coq Sportif. The brand doesn’t represent that many clubs, which is a pitty because they make awesome product. 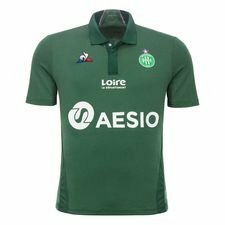 The Saint-Étienne Home Shirt is made with a classic collar and a nice dark green colour, which puts it on the 4th place. Nike is at it again with PSG’s new Away Shirt. This might be one of the most hyped shirts this season and makes us think back on their Third Shirt from the 2016/17 season. 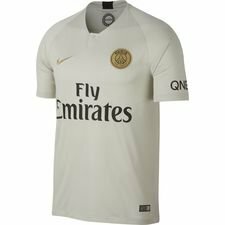 The new Away Shirt is made in a grey and beige combination, with a golden touch on the PSG crest and Nike Swoosh. The pictures pretty much talks for itself! We can’t get past West Ham’s new Away Shirt made by Umbro, just stunning. The blue colour is not something that you would connect with West Ham due to the other Premier League rivals from London. But the blue details have always been a part of the West Hams Shirt, and when the club used a darker blue shirt when they were founded in 1892 as Thames Ironworks. 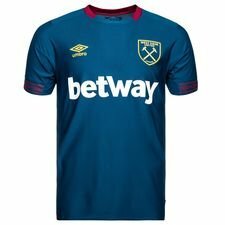 The new Away Shirt pays tribute to foundation of the club, while rocking glolden details on the crest and Umbro logo, and Bordeaux on the collar and sleeves. Did you see this one coming? On first place of the Top 10 list we find the awesome and stunning Lazio Home Shirt. Lazio has always been known of rocking light blue home kits with white details. This year Macron has taken the Home Shirt to whole new level, with adding the well-known eagle on the front as a big detail. The eagle is also a synonym for Lazio and is used by the club due to their nickname le Aquile, meaning the Eagles. The eagle print splits the shirt into two halves where the upper part is white and lower is light blue. Browse through our huge assortment of club shirts and buy your next shirt at Unisport.